If it’s cold outside and you’re looking for a warm drink with a hint of summer, look no further than hot dragon eye tea (also called longan tea). 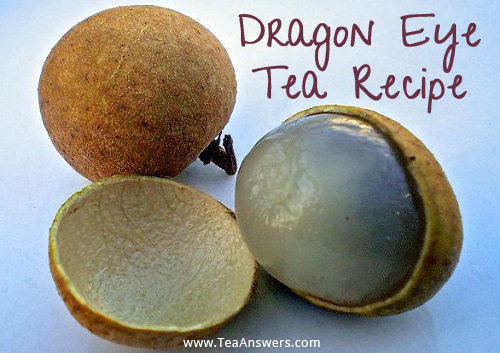 Longan, or dragon eyes, is a fruit produced in Fujian province of China. Longan get the name dragon eyes from their appearance when fresh – white and translucent flesh with a dark seed give it the appearance of an eyeball with pupil/iris. Eaten fresh in the summer, longan are dried for winter use. Dried longan (Arillus euphoriae longanae) have a dark red wrinkled skin and pulp wrapped around a small black seed. (Sometimes the seed is removed when you buy dried longan, making them more of a golden color). Longan can be purchased at Asian or global food markets. They usually come packaged in small flat boxes with see-through lids. Additionally, they can be purchased online at Amazon. One of my favorite places to have dragon eye tea was at Lucy’s Tea House, a small unassuming eatery in Mountain View, CA. When the cold winds blew down Castro Street, it was nice to slip inside Lucy’s and have Martha bring me a warming cup of dragon eye tea. Alas, Lucy’s is no more and I have to make my own dragon eye tea and new memories. Longan contains vitamins A and C, making it a good helper for winter cold and flu season. In Traditional Chinese Medicine, longan works with the heart, kidney, liver and spleen meridians. It is given as a tonic to strengthen and replenish these organs. Longan has a calming effect, which may help with insomnia and memory. It is also an antioxidant and is anti-inflammatory. Most authorities agree that longan has few risks. However, if you have fluid retention issues, or have mucus or phlegm in your lungs, consult with your health care provider before drinking tea made with longan. Place your tea in a pot. Place longan in the bottom of your teacup. Strain the hot tea into your cup over the longan. After the tea is gone, scoop out a dragon eye. Place it on your tongue and savor the tarty sweetness of summer. If it has a seed, you can eat the seed, but spitting it discreetly into a napkin or your spoon also works. I hope you enjoy longan tea (or dragon eye tea) as much as I do. I’m going to make myself a cup now! Which Breakfast Goes Best With Tea?